Packed and priced per dozen. 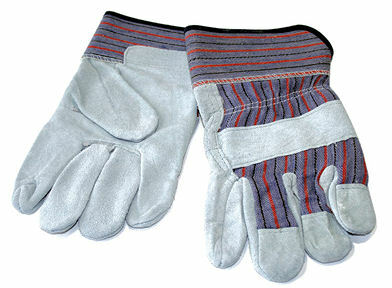 This is our standard duty leather palm, canvas back work glove. Leather fore-finger and leather fronts and tips on the other fingers with a leather strap across the knuckles. Inside the palm is cotton lined, and there is elastic across the back for a comfortable fit. Gauntlet type cuff, and the glove is made of soft pliable leather for a good fit and a long life. Stay productive and avoid injuries. 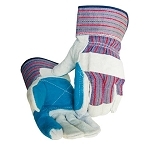 Our leather palm work gloves protect from cuts, scraps and abrasion.